New York — An unprecedented demand of data is driven by the pressing human mobility challenges of our time. With emerging technology bringing vitality to the field of migration data, and safer, better regulated migration becoming a key global priority, the potential for an era of evidence-based policy has never been greater. This required the United Nations to re-think its work. The General Assembly in recent years repeatedly called for reinforced effort towards reliable data and information on migration to support evidence-based policy-making and to counter widely held misconceptions. The New York Declaration for Refugees and Migrants emphasized the role of international cooperation to improve migration data through capacity-building, financial support and technical assistance. On the International Migrants Day (IMD), the United Nations Secretary-General António Guterres in his appeal marked the evidence of contributions of the world’s 258 million migrants. On 18 December 2017, the occasion of IMD, IOM launched the World Migration Report 2018 — the first since IOM assumed its role as the UN Migration Agency — and the Migration Governance Indicators, both serving as strong evidence bases for policy makers to close the knowledge gap and to regulate migration more effectively in an increasingly interconnected world. 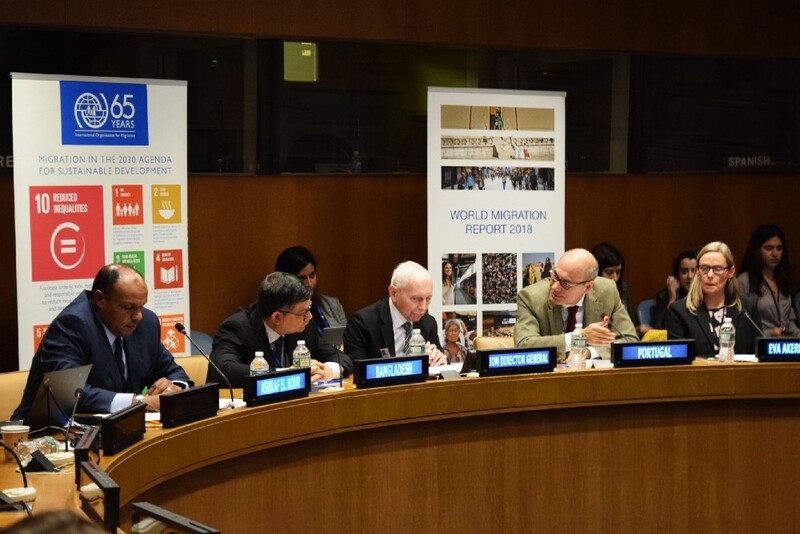 Francisco Duarte Lopes, Permanent Representative of Portugal to the United Nations discussed the country’s migration governance structures marked by the Migration Governance Indicators and expressed thanks to IOM for enabling countries to strengthen their own policy areas. Masud Bin Momen, Permanent Representative of Bangladesh to the United Nations, praised the robust role of IOM in providing support to Bangladesh as 650,000 Rohingya seek refuge in the country since August. “IOM has become greater than ever since joining the United Nations. I’m pleased to see that some of the best practices and pilot projects initiated in Bangladesh in partnership with IOM were placed in the report,” Ambassador Bin Momen said. Both Ambassadors expressed hope that the essence of this report will be reflected in interventions made to shape the Global Compact on Migration. At the first panel on the World Migration Report 2018, Marie McAuliffe, Head, Migration Policy Research Division of IOM and co-editor presented the revitalized report in a new two-part structure. She highlighted the outcomes and policy implications of Chapter 7, “Understanding migration journeys from migrant’s perspectives”, stressed that understanding of migrant’s choices is of fundamental importance to more effective policy-making. William Allen of Oxford University critically examined current trends and journalistic practices on migration through findings of Chapter 8, “Media reporting of migrants and migration”. The interaction focused on how Member States can develop migration policy that balances decision-making of migrants and the labor demand of receiving countries. The second panel focused on the Migration Governance Indicators, which operates as a capacity-building tool and helps governments identify good practices and areas to be strengthened. 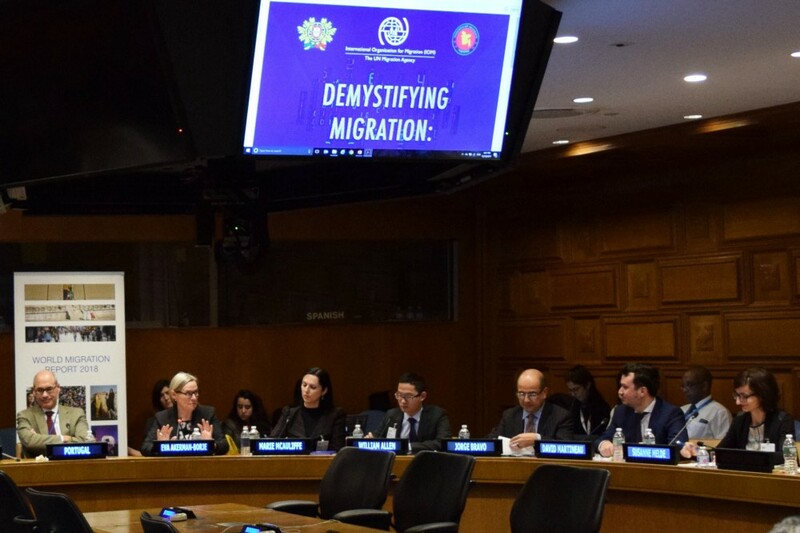 IOM’s Suzanne Melde and David Martineau shed light on the definition of good migration governance through well-managed migration policies and elaborated on the better usage of the Indicators. Jorge Bravo from United Nations Department of Economic and Social Affairs (DESA) revealed the joint IOM-DESA work on developing indicators and providing data relevant to the implementation of the Sustainable Development Goals (SDGs) on migration, particularly target 10.7. IOM’s recently launched Migration Data Portal is a strong step towards making migration data built on multiple sources more accessible for policy makers. At a separate event co-organized by IOM, the United Nations University (UNU) as Chair of the Global Migration Group (GMG) with DESA and the World Bank Group launched the GMG Handbook on Migration Data. DESA’s Bela Hovy, IOM’s Suzanne Melde and World Bank’s Sonia Plaza discussed how the Handbook can provide guidance on improving country-level capacity in the production and use of migration data for development, and contribute to the monitoring of the SDGs. 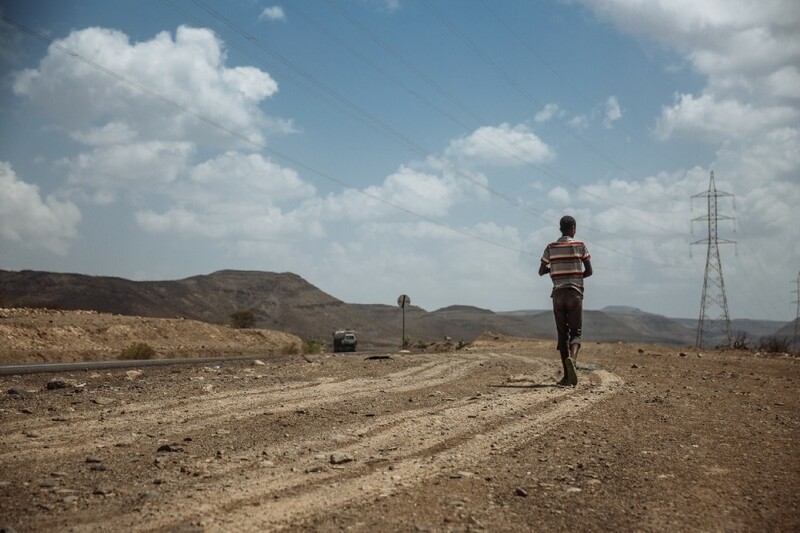 A key objective of IOM activities in the field of migration data is to enhance the capacity of governments to collect reliable and comprehensive data on migration and to advance the understanding of migration issues. This approach, based on evidence and knowledge, is opening up an avenue to help policymakers, practitioners and researchers to make better sense of migration, and ensure migration works for all.